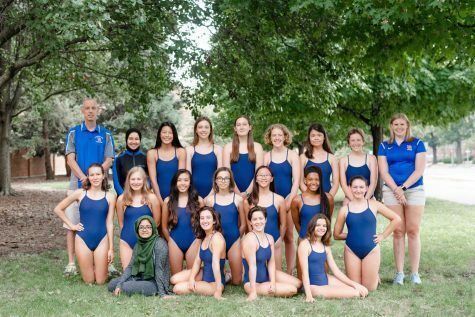 The girl’s swim team had a great season last year and is hoping to build on that momentum. Senior and captain Emma Loewenstein said the team has lots of new swimmers this year, notably freshman Sally Ma who has previous swimming experience and shows promise. The other captains this year are seniors Raine Bernhard, Annemily Hoganson, Emma Hummel, and Victoria Kindratenko. The team also has two divers this year, one more than last year: junior Samaia Jones and freshman Bronwyn Garrett. The divers will help the team be competitive with larger schools in the area. The team has big goals for this year. They want to be competitive with Central and Centennial High Schools, who have lost a number of key swimmers from last year. “We hope to be up there by the Twin City meet,” said Loewenstein. The Twin City meet will take place on Oct. 16. Loewenstein also emphasized the captains’ goal to keep everyone in high spirits during the season. “We always try to make sure it’s a healthy environment. Swimming takes up a ton of time (…) So we always try to make it a goal to make sure people are having fun and they aren’t putting so much pressure on themselves,” said Loewenstein. They are planning to have a “captains’ day” soon which will consist of an across-campus scavenger hunt. Last season the team had a lot of success at sectionals and state that will be hard to match. Ema Rajic (‘18) won both the 100 breastroke and the 200 individual medley (IM) at state for the second year in a row. Freshman Reed Broaders placed 12th in the 50 free and 10th in the 100 fly. The team also qualified for state in two relays: the 200 medley and the 200 free. Although they have lost some fast members of their team, Loewenstein said they are hoping to have similar results at sectionals and state this year. This means that new swimmers will have to step up in relay spots. The team’s next meet is this Saturday at Springfield High School. The team recently competed at a relay meet at Indian Acres on Saturday against other area teams to raise money for CU at Home, a charity for homeless people in Champaign Urbana. They placed second.